Girls Team, right to left, front row: Madisyn Englehardt, Makayla Bloomingdale, Sophia Holsinger, Amilia Bronnimann, Zoey McGuire, Maddie Schurr, Chloe Warner,Middle Row: Izze Hamilton, Katie Holsinger, Tatym Mylin, Amber Goldhagen, Emily Kastner, Rylie Berg, Bella Mastroianni, Lily Henderson, Gracie Wang, Back Row: Camyrn King, Gracie Colvin, Megan Franklin, Avery Miles, Paige Bryer, Vianca Perez. Boys Team from left, front row: Aidan Paaccagnini, Owen West, Collin Benkovich, Garrett Preston, Ian Blankenship, Ray Groomes, Middle Row: Grant Rasmussen, Jack Eck, Visvai Subramanian, Kristofer Coldwate, Jack Kitzman and Austin Anderson, Back Row: Cale Miles, Damian Harms, Max Rossow and Vito Skominas. 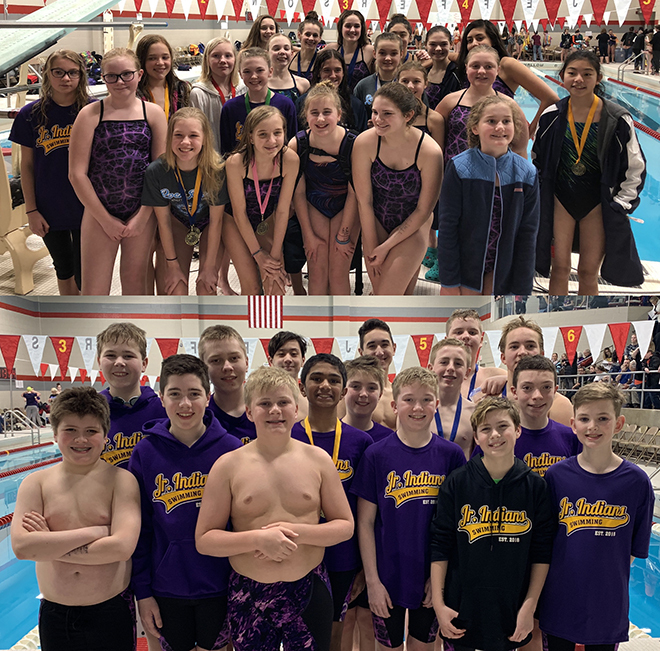 The JR Indians Middle School Swimming Teams continued the success they had from their inaugural 2018 season by repeating as the 2019 Rock River Athletic Conference Champions. 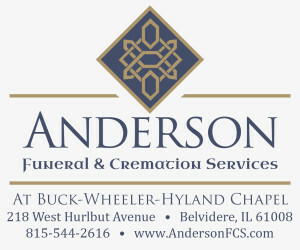 The conference consists of teams form the Rockford Public School District, Harlem and Freeport. The JR Indians team can have boys and girls from the four middle schools that feed Hononegah High School; Roscoe, Stephen Mack, Shirland and Willowbrook. The team is led by The Stateline Aquatic Team and their Head Coach Scott Kitzman. The season began on Jan. 9 with 42 swimmers from all schools but Shirland Middle School having members. From Jan. 9 through March 8 the team competed in five dual meets and practiced three nights a week at Beloit College. The Girls and Boys teams were 5 0 in their 2019 dual meets. On Saturday, March 9 the JR Indians competed in Conference Championship meets for both the boys and girls at Jefferson High School. The boys meet was held in the morning and the girls meet was in the afternoon. The JR Indians Boys Teams battled throughout the meet to repeat as the Boys Conference Champions. The boys team started out the meet by winning 200 Medley Relay with the relay team Jack Kitzman, Cale Miles, Vito Skominas and Max Rossow swimming a 2:03.75. Kitzman set a meet record in the 50 back leading off the relay with a time of 28.94. The same four ended the meet by winning the 200 Free Relay with a time of 1:47.36. In between the JR Indians were led by Kitzman who won the 50 Free with a time of 24.67 and was 2nd in the 100 Free with a 52.93, Miles who won the 100IM with a time of 1:03.21 and was 2nd in the 50 Fly swimming a 28.80 and Skominas who won the 50 Breast with a time of 34.19 and was 2nd in the 100 IM with a time of 1:10.57. Collin Benkovich also had a solid performance winning the 25 Breast with a time of 20.95 and placing 4th in the 25 Fly with a time of 18.91. Other JR Indian boys with strong efforts were, Austin Anderson was 3rd in the 25 Free; 14.88 and 6th in the 25 Back; 18.66, Ian Blankenship was 9th in the 25 Breast; 25.51, Kristofer Coldwate was 7th in the 25 Free; 15.51, Damian Harms placed 2nd in the 25 Free; 14.72 and 3rd in the 50 Breast; 40.31, Aidan Paccagnini was 8th in the 50 Fly; 42.72 and the 100 Free; 1:15.77, Visvai Subramanian was 4th in the 25 Back: 18.49 and Owen West placed 2nd in the 25 Back with a time of 17.40. The 100 Medley Relay team of West, Harms, Benkovich and Colwate finished first with a time of 1:08.45 and the 100 Free Relay team of Anderson, West, Harms and Coldwate finish 3rd with a time of 58.66. It took a great team effort in order for the JR Indian Boys to repeat as Conference Champions. To accomplish this feat, every JR Indian boys team member had to compete hard and contribute team points in a very closely contested meet. The boys had to win the last relay to outdistance Eisenhower Middle School. The JR Indian Boys finished with 335 followed by Eisenhower with 326 and West/Marshall with 204. In the afternoon session the JR Indian Girls showcased their talent and depth to repeat as 2019 Conference Champions in record setting fashion. The girls 200 Medley Relay team of Gracie Colvin, Amber Goldhagen, Avery Miles and Camryn King started out the girls meet by finishing 1st with a time of 2:03.27. They broke the meet record set in 2010 by over 9 seconds! Colvin broke her own conference 50 back record leading off the relay with a 29.98 leg. Miles then placed 1st in the 100IM with a time of 1:06.17 with teammate Megan Franklin placing 2nd swimming a 1:11.22. The girls showed their depth in the 25 Free with Katie Holsinger finishing 2nd; 16.65, Jenna Harms 3rd; 16.71, Sophia Holsinger 4th; 16.74, Madisyn Englehart 5th; 16.76 and Rylie Berg 7th, 17.02. Colvin repeated as the 50 Free champion, winning by over 3 seconds with a time of 27.03 with Paige Bryer placing 4th; 31.24. The 100 Medley Relay team of Bryer, Goldhagen, Franklin and Sophia Holsinger finished 1st and set another meet record with a time of 1:04.52. The girls had three swimmers in the top 7 in the 25 Fly led by Vianca Perez finishing 2nd; 18.39, Tatym Mylin; 18.67 and Emily Kastner 7th; 18.84. Miles out touched club teammate Sydney Turner from West Marshall with a record setting time of 28.98, King was 4th with a time of 32.95. Bryer, Berg, Kastner and Perez teamed up to win the 100 Free Relay with a time of 1:01.74. Colvin continued her dominance in the 100 free, repeating as conference champion with a time of 57.61, Goldhagen was 3rd with a time of 1:06.39. Bryer won the 25 back with a record setting time of 16.44, Berg was 2nd; 19.32, Gracie Wang 4th; 19.42 and Lily Henderson 8th; 20.14. Franklin repeated as the conference champion in the 50 Back with a time of 31.60 with King a close 2nd swimming a 32.52. In the 25 Breast Izze Hamilton placed 4th with a time of 23.17 and Amelia Bronnimann finished 6th; 23.66. Goldhagen outdistanced club teammate Zoe Shields, swimming for Harlem, in the 50 Breast with both swimmers breaking the meet record, Goldhagen’s time was 35.80. The girls finished the day with another record setting performance in the 200 Free Relay, with the team of Miles, King, Franklin and Colvin finishing 1st lowering the record by over 3 seconds with a time of 1:51.84. The JR Indian girls totaled 385 points followed by Eisenhower with 275.5 and Harlem with 246. Coach Kitzman was very happy to see how the boys battled throughout their meet and being able to repeat as champions. He was also excited to see the girls dominant and record-breaking performances at Conference. Many of the JR Indian swimmers started swimming outside the Middle School season after last year’s meet. Their hard work showed up in the pool, establishing many meet records for future JR Indians to set their sights on. He was very proud to see the great sportsmanship they showed, something that is stressed throughout the season. For more information on the JR Indians and The Stateline Aquatic Team visit www.swimstateline.com.